Comedian Bovi says beautiful women are sometimes the downfall of great men. Bovi statement comes after Big Brother Naija Housemate, Kemen was disqualified and evicted for molesting fellow housemate, TBoss. Comedian Bovi shared his own view about the issue on his Snapchat page. 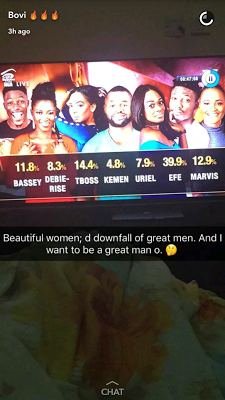 0 Response to "'Beautiful Women Are The Downfall Of Great Men' - Bovi, On Kemen's Disqualification"